In this tutorial, we will learn how to use the Spring Boot Security Starter to secure SpringMVC-based web applications. We will develop step by step Message Storing Spring MVC web application(securing with spring security) using spring boot, spring MVC, role-based spring security, JPA, thymeleaf, and MySQL. Security is an important aspect of software application design. It ensures that only those who have authority to access the secured resources can do so. When it comes to securing an application, two primary things we’ll need to take care of are authentication and authorization. Authentication refers to the process of verifying the user, which is typically done by asking for credentials. Authorization refers to the process of verifying whether or not the user is allowed to do a certain activity. Spring Security is a framework for securing Java-based applications at various layers with great flexibility and customizability. Spring Security provides authentication and authorization support against database authentication, LDAP, Java Authentication and Authorization Service (JAAS), and many more. Spring Security provides support for dealing with common attacks like CSRF, XSS, and session fixation protection, with minimal configuration. In this tutorial, we will use Java-based configuration support for security. Using Spring Security in Spring Boot application became easier with its autoconfiguration features. Before moving to secure actual projects, let's discuss spring boot provided autoconfiguration of spring security for a quick start. Enable common low-level features such as XSS, CSRF, caching, etc. Now if you run the application and access http://localhost:8080, you will be prompted to enter the user credentials. The default user is user and the password is auto-generated. You can find it in the console log. Okay, this is nice for a quick demo. But in our actual projects, we may want to implement role-based access control using a persistence data store such as a database. Also, you might want to fine-tune access to resources (URLs, service layer methods, etc.) based on roles. Now it's time to see how to customize the default Spring Security autoconfiguration and develop step by step Spring MVC web application. We will develop step by step message storing Spring MVC web application(securing with spring security) using spring boot, spring MVC, role-based spring security, JPA, thymeleaf, and MySQL. 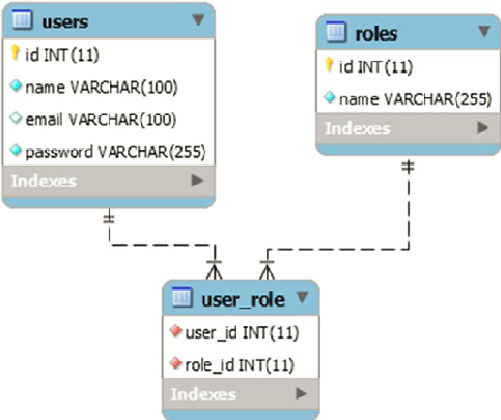 First, we’ll create the database tables as below to store users and roles. Next, create the Spring Data JPA repository for the user entity. Next, create the Spring Data JPA repository for the Message entity. Spring Security uses the UserDetailsService interface, which contains the loadUserByUsername(String username) method to look up UserDetails for a given username. The UserDetails interface represents an authenticated user object and Spring Security provides an out-of-the box implementation of org.springframework.security.core.userdetails.User. Now we implement a UserDetailsService to get UserDetails from database. Spring Boot implemented the default Spring Security autoconfiguration in SecurityAutoConfiguration. To switch the default web application security configuration and provide our own customized security configuration, we can create a configuration class that extends WebSecurityConfigurerAdapter and is annotated with @EnableWebSecurity. Now we’ll create a configuration class that extends WebSecurityConfigurerAdapter to customize the default Spring Security configuration. This example configures CustomUserDetailsService and BCryptPasswordEncoder to be used by AuthenticationManager instead of the default in-memory database with a single-user with a plaintext password. Ignore the static resource paths "/resources/", "/webjars/", and "/assets/**"
Allow everyone to have access to the root URL "/"
We are also configuring custom form-based login parameters and making them accessible to everyone. The example also configures the URL to redirect the users to the /accessDenied URL if they try to access a resource they don’t have access to. We are going to use Thymeleaf view templates for rendering views. The thymeleaf-extrasspringsecurity4 module provides Thymeleaf Spring Security dialect attributes (sec:authentication, sec:authorize, etc.) to conditionally render parts of the view based on authentication status, logged-in user roles, etc. Add the following dependency to use the Thymeleaf Spring Security dialect. Now we need to create a configuration class for providing MVC configuration. Note that we have configured view controllers to specify which view to render for which URL. Also, it registers SpringSecurityDialect to enable using the Thymeleaf Spring Security dialect. Spring Security provides the Remember-Me feature so that applications can remember the identity of a user between sessions. To use the Remember-Me functionality, you just need to send the HTTP parameter remember-me. Simple hash-based token as a cookie —This approach creates a token by hashing the user identity information and setting it as a cookie on the client browser. Persistent token —This approach uses a persistent store like a relational database to store the tokens. In this tutorial, we will use the Persistent token approach. We will implement Spring Security Remember-Me feature, which can be used to store the generated tokens in persistent storage such as a database. The persistent tokens approach is implemented using org.springframework.security.web.authentication.rememberme. PersistentTokenBasedRememberMeServices, which internally uses the PersistentTokenRepository interface to store the tokens. Spring provides the following two implementations of PersistentTokenRepository out-of-the-box. InMemoryTokenRepositoryImpl can be used to store tokens in-memory (not recommended for production use). JdbcTokenRepositoryImpl can be used to store tokens in a database. The JdbcTokenRepositoryImpl stores the tokens in the persistent_logins table. Now that we have all the configuration ready, it’s time to create views using Thymeleaf. The most important part of this page is layout:fragment="content". This is the heart of the decorator page (layout). This is the tutorial uses Standard Thymeleaf Layout System. This code creates the login form with the username and password fields and renders a login error if there is an error request parameter. The code configures the login form failureUrl to "/login?error", so if the users provide incorrect credentials, they will be redirected to the /login?error URL. <button type="submit" class="btn btn-primary btn-block btn-flat"
The code configures "/home" as defaultSuccessUrl, so after successful authentication, users will be redirected to the /home URL, which will render the userhome.html view. In the userhome.html view, you are using sec:authentication="principal.username to display the authenticated username. This example also conditionally renders the link to the admin’s home page only if the authenticated user has the role ROLE_ADMIN. This is done by using sec:authorize="hasRole ('ROLE_ADMIN'). The above file is our decorator for content pages we will be creating in the application. The most important thing about the above example is layout:fragment="content. This is the heart of the decorator page (layout). You can also notice, that header and footer are included using Standard Thymeleaf Layout System. Before running this application, we need to initialize the database with some sample data for users and roles. The passwords are encrypted using the BCryptPasswordEncoder.encode(plan_tx_password) method. From your IDE, run the SpringbootThymeleafSecurityDemoApplication.main() method as a standalone Java class that will start the embedded Tomcat server on port 8080 and point the browser to http://localhost:8080/. After submitting the valid credentials (such as admin@gmail.com/admin), you will be redirected to the home page. If you have logged in as a user with the ADMIN role, you should be able to see the text You will see this only if you are ADMIN and a link to Admin Home. If you have logged in as a normal user (user@gmail.com/user), you will not be able to see You will see this only if you are ADMIN and a link to Admin Home. We create and list messages to and from database. This is the end of the application flow and tutorial. Note that I haven't used webjars feature and I have manually added css and js in asset folder. 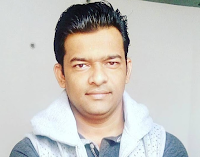 Download CSS and js from my GitHub repository. Do comment if you don't understand any flow or code. My suggestion is to clone the source code of this tutorial and import to your IDE and try to run it. I enjoyed your post Spring Boot + Spring MVC + Role Based Spring Security + JPA + Thymeleaf + MySQL Tutorial. I've been in your github repository I downloaded it, but when I run the project show up 404 error - Whitelabel Error Page. Can you confirm if this project that is in github is running 100%? Thanks for pointing missing web package and i added missing part. The AuthenticatedUser class is not needed to run this project. I confirmed this project should work. Please following urls and let me know if you face any issues. I got error. Error creating bean with name 'entityManagerFactory' defined in class path resource I tried every resolution posted online but nothing works. clone github repository of this tutorial (given link at end of this tutorial) and try to build maven spring boot project successfully should work. Plz re-check database configuration and MySQL setup. Thanks a lot ; it's a very nice tutorial. Thanks a lot, it really helps a lot. However, how do I create a register page for the system? Hi Ramesh Fadatare,Thanks for the tutorial,I found your tutorial very useful,but my problem is it is authenticating only using username or email it is ignoring password validation can please expline about this issue.Thank you.